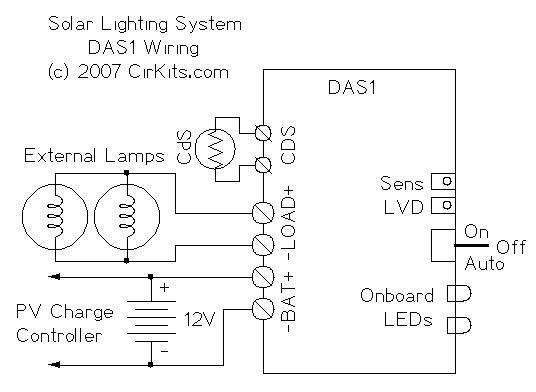 The DAS1 kit can be used to automatically turn on 12V lamps or other loads when it becomes dark. It has an on-board switch for selecting Off, Always On and On-at-Dark (Auto) operation. The DAS1 can control up to 10 Amps of 12V DC load, it also includes two bright white LEDs for a low power self-contained light source. The DAS1 is perfect for controlling external arrays of 12V white LED lamps, 12V fluorescent lamps and 12V incandescent lamps. Use it for indoor/outdoor accent lighting, street lighting, security lights, automatic highway signs and much more. An external source of 12V DC power is required, suitable power sources include a solar-charged battery, a line-powered DC power supply or an automotive/marine power system. The DAS1 is designed to operate in conjunction with the CirKits SCC3 solar charge controller, a 12V rechargeable battery and a photovoltaic (PV) panel. Controls and indicators include an on-board Off/On/Auto (On-At-Dark) switch and two bright white LEDs which operate in parallel with the external load. The adjustable low voltage disconnect (LVD) function is automatic. See the DAS1 specifications for details on the kit's capabilities. The DAS1 Photo Gallery shows some real-world uses of the DAS1. 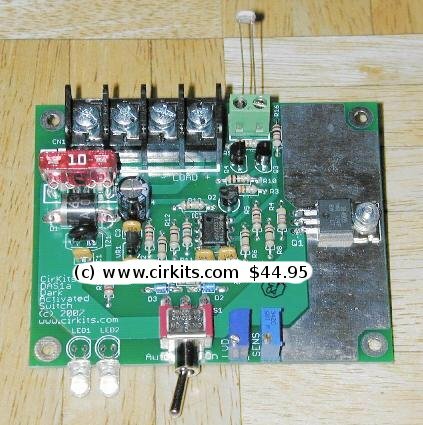 External lamps and solder are not included with this kit.